Ronan Curtis celebrates at full-time. 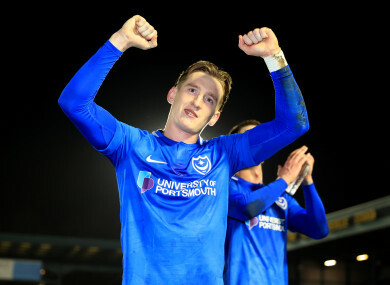 REPUBLIC OF IRELAND striker Ronan Curtis was among the scorers in Portsmouth’s 3-0 win over Bury in the Checkatrade Trophy semi-final. Curtis sealed a comfortable Pompey win, having led through second-half goals from Gareth Evans and Oliver Hawkins. Those goals came within three minutes of each other; Curtis’ 13 minutes from time. Curtis is enjoying a fine season at Fratton Park, with this his tenth goal of the season. Portsmouth will now return to a Wembley final for the first time since the 2010 FA Cup final defeat to Chelsea, and will face either Bristol Rovers or Sunderland in the final on 31 March. The cup run comes during a period in which their league form has collapsed: having led the League One table, they are now fourth, ten points from the top and without a league win since New Year’s Day. Email “Curtis on score-sheet again to steer Portsmouth to Wembley final ”. Feedback on “Curtis on score-sheet again to steer Portsmouth to Wembley final ”.